Professional Carpet Systems utilizes the method approved by the world’s largest carpet manufacturers, including Shaw, Mohawk, World, Aladdin, Beauleu, and many more. It is safe, effective and dries fast. We also recognize that when we are in your home that we are working guests and our courteous Cleaning Specialists will treat it with the utmost respect and consideration. Upon arrival at your residence, we do a walk through to review the order with you and assess the current condition of the carpet. The technician will set up protective equipment to protect the customers interior walls, stair cases, hardwood floors, base boards, and even your lawn. Upon customer request we prespray our ultra safe, no odor, no voc’s, hypo allergenic, totally green carpet pre-spray to all your carpet being cleaned to emulsify and breakdown the oily binders that are holding the soil to the carpet fibers. By the way, the cleaning agents that we use in your home are registered and approved by the IAQ, the Carpet & Rug Institute and they are Green Seal Certified. Now it is time to Power Rinse your carpets. We utilize hot water extraction through our cleaning system located in our vehicle. We only need to bring in two hoses to perform this task, so your home is not cluttered with portable equipment. The truck-mounted units in our vans are of top quality and extremely powerful for maximum soil and water removal. This Method of cleaning is recommended and now required for warranty purposes by most the top Carpet Manufacturers like Mohawk, Shaw, Dupont Stain master, Dixie Home, and Beaulieu. Upon customer request, we now apply carpet protection. This valuable service gives protection from spills that might otherwise stain your carpets and retards the re-soiling process. 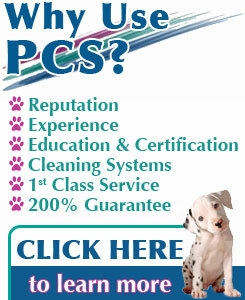 At this time we will also apply pet enzymes if required as part of our pet stain and odor removal process. The enzyme will be active at eating away organisms as long as moisture is present in your carpet. The last step in the carpet cleaning process is to groom the carpet to make sure all the carpet fibers are standing tall. This will create a more resilient pile and enhance the beauty of your carpet. It will also cut down the drying time. If you are available, the technician will walk through the house with you and make suggestions about how to maintain your carpet and schedule your next appointment.